Clam shell sealers will spot seal the edge of various clam shell containers. The ultrasonic models use ultrasonic waves to quickly and effortlessly achieve the spot weld. The other models us a heated jaw that places the weld onto the clam shell container. 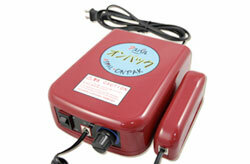 OnPak - OnPak is an ultrasonic clam shell sealer that seals clamshells quickly and safely using ultrasonic waves. It is simple and easy to operate. Just turn on the machine, set the time and spot weld using the hand set. No warm up time needed. OnPak seals PVC, PSP, OPS, HIPS, PPF, PP and A-PET containers. Weld size is 3mm x 6mm. 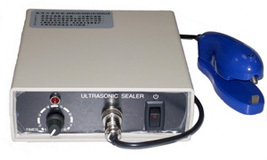 AIE-405US - Also an ultrasonic clam shell sealer that seals clamshells quickly and safely using ultrasonic waves. It is simple and easy to operate. Just turn on the machine, set the time and spot weld using the hand set. No warm up time needed. Will spot seal OPS, PSP, PVC, and EPS food. Weld size is 2.5mm x 3.5mm. KF-772DH - is equipped with two heated 4mm x 10mm serrated jaws. Two temperature settings are available: 356°F and 410°F (180°C and 210°C). 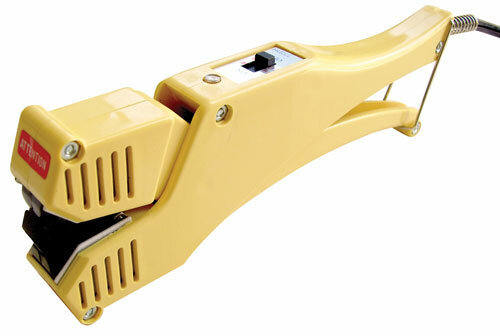 Our KF-772DH clam shell sealer can be used to weld OPS, PSP, PVC, and EPS food packaging cases. The clam shell sealer is ideal for sealing poly packing cases such as clam shell and other similar types of containers. Handles remain cool during operation. The sealer can be used in voltages ranging from 100-240 volts. 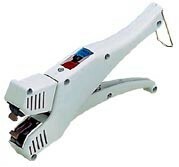 AIE-772 - like the KF model, this AIE unit is equipped with two heated 5mm x 10mm serrated jaws. Two temperature settings are available. Supplied with a high and low temperature control switch with power light. To spot seal OPS, PSP, PVC, and EPS food. OnPak 3mm x 6mm 40 Northridge, CA 4 Lbs. NEW LOW PRICE!! If video not showing on mobile device, search for 9gpxDrzeRjo in YouTube app.